"At the end of August 2015, when the first wave of refugees came to our territory, with a group of friends we went every day to help in Bapska, in Tovarnik, later in Opatovac. It was solidarity that moved me. Here in Croatia many were refugees not so long ago and still remembered what it means to be driven out of your home. At that time, the borders were open and refugees were still seen as human beings. We worked together, volunteers from all over the world, the police, the locals who collected food and basic necessities. It was nice to see how people managed to organise, and very quickly", recalls Dragan Umičević. Dragan, a retired veteran from Osijek, has continued to volunteer for refugees both in Croatia and in Serbia and Greece. When the Balkan route was already closed, in collaboration with the NGO Are you syrious? (AYS), he assisted some refugees by going personally to the border with Serbia, to be sure they were allowed to apply for asylum in Croatia. 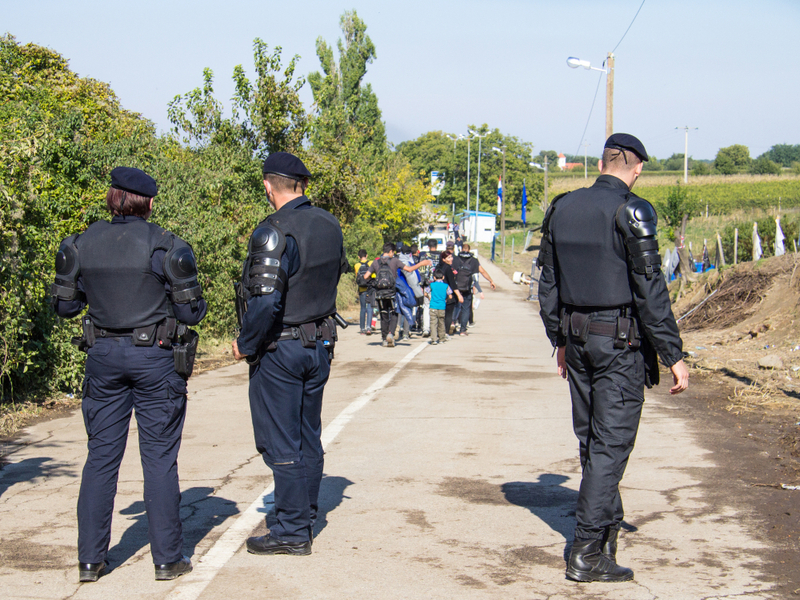 In fact, for some time now, many NGO testimonies on the field agree that the Croatian police carries out illegal rejections of refugees, accompanied by violence, denying them the right to asylum. On the night of March 21st, 2018, being the closest volunteer, Dragan went to Strošinci on the recommendation of AYS, that was in contact with a group of refugees who had just entered Croatian territory. Among them were the family members of Madina Hussiny, the little Afghan girl who was hit by a train after her group, in a previous attempt to cross the border, had been illegally returned to Serbia by the Croatian police. "In a group of 14 people there were 11 minors, including some very young children. There was a storm, they were frozen, wet, worn out. At the border I contacted the police, explaining the situation, and acted in cooperation with them. It would not have been possible to do otherwise", continues Umičević, who then indicated the way to the refugees by flashing the headlights of his car. "When the refugees arrived, the police told me I could go home, but I preferred to take them to the police station to make sure that their asylum application was presented. After an informal interview, during which no accusation against me was advanced, I left". Two weeks later, however, Umičević learned that he had earned the ungrateful role of the first activist targeted by a judicial proceeding for a crime of solidarity in Croatia. Charges questioned both the fact that the police had authorised him to flash to the group of refugees and his awareness, at the time, of the exact position of the refugees in relation to the Croatian border. In first instance, he was found guilty of "unwitting negligence" – as, despite being notified of the geolocation of the group of refugees, already in Croatia, he acted without being able to verify it – and sentenced to pay a fine of 60,000 kunas (over 8,000 Euros). The prosecution, however, had requested a fine of 320,000 kunas, two months in prison for the volunteer, and the ban on the activity of AYS. "The purpose of the sentence is to discourage volunteers, who will think twice before engaging, especially if the sentence is confirmed, and then the police will have their hands free. This can be transferred to other segments of everyday life", concludes Umičević, who is now awaiting the appeal. In the meantime, he has received the solidarity of the people around him, civil society, and some media. "That I know of, no politician has expressed solidarity. They have nothing to gain from that". Indeed, the Croatian political scene has been silent not only in front of his case, but in the face of the systematic violations of refugee rights in general. On October 23rd, Platforma 112 , which brings together many Croatian human rights organisations, once again invited Prime Minister Andrej Plenković and Interior Minister Davor Božinović to suspend attacks on associations supporting refugees, demanding independent investigations and punishment not of those who defend human rights, but those who violate them. This was only the last of the appeals, which followed the letter from Council of Europe Commissioner for Human Rights Dunja Mijatović to Prime Minister Plenković, in which the Croatian government was asked to stop police violence on refugees trying to enter the country. The reticence of the Croatian police in providing access to information was also highlighted in the 2017 report by ombuswoman Lora Vidović, whose office, as reported on the official site itself , receives daily inquiries by foreign and local media on cases of violence and violation of rights – impossibility of applying for asylum in the country – to the detriment of refugees. The appeal by Platforma 112 has fallen on deaf ears, with no reaction from either Croatian politics or European governments. For a European Union that seeks to outsource the management of refugee flows as much as possible and no matter what, violence on its doorsteps is not news. According to UNHCR report Desperate Journeys , with 700 reported cases of violence and theft at the border, Croatia holds the negative record among the countries of the area, compared to 150 and 140 cases, respectively, in Hungary and Romania. Intimidations against solidarity in Croatia have intensified since Madina's family entered the country. The family was detained in the Tovarnik closed camp for over two months after applying for asylum in Croatia, and transferred to an open structure only after repeated interventions by the European Court of Human Rights. The NGOs (AYS and Center for Peace Studies) and lawyers (Ivo Jelavić and Sanja Bezbradica) who supported the family in their search for the truth received pressures. Umičević's conviction is part of this framework. The Croatian events cannot be separated from the European context of criminalisation of solidarity, with a series of judicial proceedings in Italy, France, Hungary, and elsewhere. Moreover, the collaboration of border police in implementing chain rejections from Italy to Slovenia, Croatia, and Bosnia and Herzegovina was exposed by a recent report by La Stampa . However, what currently stands out in Croatia is the aggressive media campaign against refugees, also stimulated in recent weeks by the news from Velika Kladuša, Bosnia and Herzegovina, where thousands of individuals are pressing at the borders of the European Union. In particular, a piece by a well-known right-wing opinionist can be seen as a sort of manifesto of the new right wing – sovereignist, anti-migrant, and contrary to secularisation. On Večernji List, Nino Raspudić compared those who selflessly help refugees to the bizarre case of a Dutch tourist hospitalised for the bite of a viper she had tried to pet. Both cases would show a deformed view of reality typical of Western civilisation, unable to recognise true evil and danger, but "happy to kill unborn children and send parents to euthanasia". The article continues by attacking NGOs, defined as "traffickers", "criminals, mobsters, mercenaries", attached "to Soros' breast". These are the same accusations periodically circulated by obscure media and Serbian, Bulgarian, Macedonian, Hungarian, and now also Italian politicians, conflating otherwise conflicting extreme right discourses in the hate speech against refugees. In the column Reakcija, also hosted by Večernji List, opinionist Mate Miljić stated that the European Union is to blame for the pressure of migrants at Croatian borders because, "in its will to create a multicultural melting pot, it has allowed mass illegal immigration". Moreover, in his opinion, the left would be ready to cut pensions for war veterans to "give them to illegal migrants". Trvtko Barun, director of Jesuit Refugee Service, replied to Raspudić on the same newspaper. Pointing to the dangers of calling to hatred and using distorted images, Barun cited Pope Bergoglio's positions on refugees, that struggle to be received in the Croatian Catholic Church. In addition to direct crusades, however, the Croatian press is spreading narratives that stimulate the construction of barriers, fuelling suspicion, fear, and lack of empathy toward refugees. In the days of pressure on the borders of Velika Kladuša, following a declaration by a local police inspector, the news circulated for days that a migrant suspected of murdering five people in Macedonia had been arrested, even after this was categorically denied by the sources of the Macedonian Interior Ministry. The very hierarchy of the news shows the construction – intentional or not – of a narrative of suspicion and fear, with refugees (now called "illegal migrants") without faces, names, and stories, seen exclusively as a threat to public order. The story of some refugees who, in days of bad weather, allegedly entered some vacant holiday homes in the mountain region of Gorski Kotar, to seek shelter and dry clothes, received great attention nationally, although the damage amounted to a few hundred Euros. As elsewhere in Europe, also in Croatia the many fake news and the prejudices circulating on the web – both on registered outlets and on social networks – find in the fear of the other fertile ground to build easy consensus and grab clicks. In a piece on Novi List, however, Ladislav Tomičić recalled that the habit of resorting to lying will leave a mark in society, which will pay the price also when the wave of refugees is exhausted.